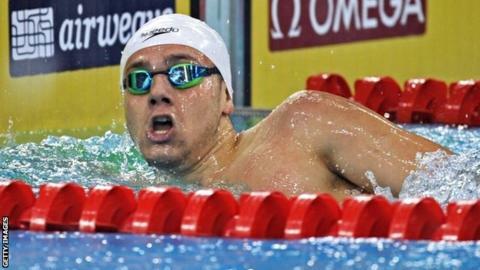 Double world champion James Guy won 400m freestyle gold as Britain claimed six medals at the World Cup in Dubai. Guy, who won the 400m and 200m events at the previous round in Doha, was joined on the podium by fellow Briton Stephen Milne who finished third. Welsh swimmer Jazz Carlin claimed two medals, adding the 800m freestyle silver to a bronze in the 200m race. Triple world champion Adam Peaty won silver in the 50m breaststroke, while Craig Benson was second in the 200m.